Comments Off on Bruins Teddy Bear Toss!! The Uxbridge Bruins host their annual Teddy Bear Toss game in support of the Uxbridge Communtiy Toy Drive on Dec. 7th against the Clarington Eagles. 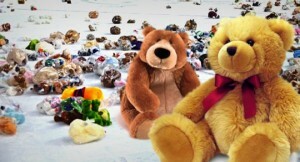 Fans are encouraged to bring new unwrapped stuffed animal or toy (that won’t get broken) in a plastic bag. When the Bruins score their first goal of the game, toss them onto the ice where they’ll be collected for distribution among local families in need during the holiday season.